I purchased 'About Face' by Scott Barnes quite recently and after reading it, I realise that my way of applying make up is changing. The book is so influential, as it's well written and examples are demonstrated with perfect visuals. 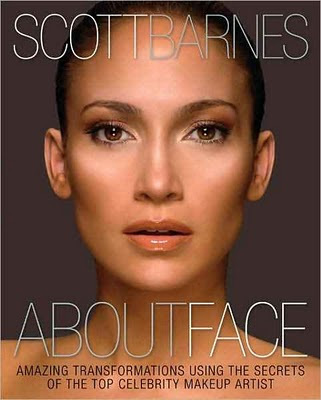 Scott Barnes has been make up artist to Jennifer Lopez over the years and is famous for making her 'glow'! The 240 page book contains a variety of makeovers on various skin tones and facial features with step by step information and expert tips. Skin care has also not been missed, there is a nice section dedicated on the subject. 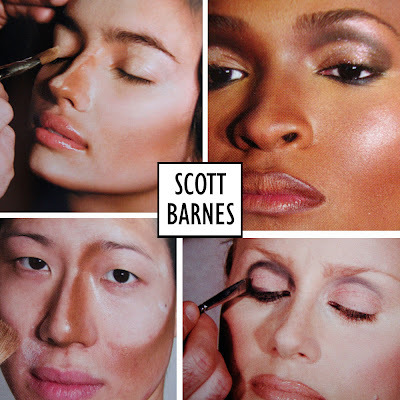 Scott Barnes' approach to makeup is very different to the most make up artists. His emphasis is mainly on the skin, trying to bring light to the face. He firstly applies a lighter shade of concealer to highlight the face, he then contours with a darker shade, and finishes off with a foundation closer to the natural skin tone to neutralise the base. Yes, this kind of technique has been used by others, but not to this level of artistic creativity. He uses yellow or red tones depending on the skin tone and what he wants to achieve. 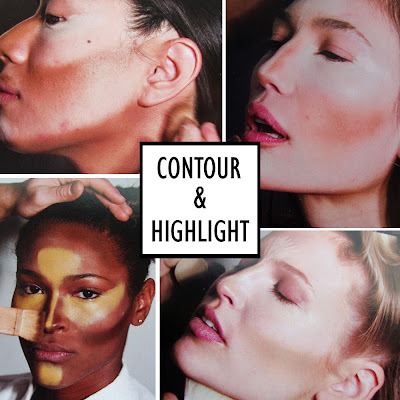 He recommends yellow based concealers for people with warm skin tones for women with dark or Mediterranean skin tones: Indian, Brazilian, African American, Hispanic, Italian or Greek. The way he applies eye make up is also quite striking, he always applies the crease colour slightly above the crease. This is a before and after of Sonia's eye, you can see what a difference it makes to the eye shape. It makes it seem less hooded and more sunken in. For me, this is the most striking makeover as her face shape looks totally different. Obviously, it looks like a lot of make up, and I'm not sure what woman can commit to doing that everyday but, there are a few tips that can be picked up and manipulated to suit your needs. The only downside to the book for me, is that he doesn't mention what brands or products he uses specifically for the makeover, he just talks about the colour. But, there is a snapshot of some products from his kit which I have included below. I purchased from The Book Depository for £14.40, free shipping worldwide. I would totally recommend this book if you are interested in make up techniques! Oh I'm DEFINITELY picking this one up! Wow! This looks absolutely amazing and is definitely going on my 'to buy' list! I just bought this book... 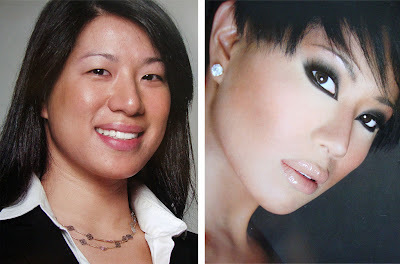 I love to see how make up can change facial featre. Thanks for this great ref! I certainly think there has been some airbrushing, I don't think they would publish it without, which is quite sad. I can't believe you did a post about this, I ordered it off amazon last week and am waiting for it to come! After seeing these photos I cannot wait till I get it. I definitely agree that skin is the make it or break it when it comes to makeup, flawless face is a must! bur just a question is this site safe? i mean how can i know where is the book or if they sent it? they gave you some sort of tracking number? in how many days arrive at your home? Thanks for posting this! I have been considering this book for awhile, think I will definitely be buying it now. The only other make-up book I've ever purchased was Kevyn Aucoin's Making Faces, which I absolutely loved as well. He was big into the contouring too. Thanks for the great review and pics! Oh wow this is a really impressing BOOK i love the before/after makeup pics ! This book seems amazing - thanks for the review! So I guess this is the secret to why JLO always looks amazing! But all the contouring does seem like a lot of work!! But I stilll want to get this book! Great post can't wait to crack this book open!!! I've checked reviews, and the majority of customers are disappointed: lost orders, damaged books, no customer service. I don't know what to think. Was the book wrapped well? I'm afraid paperbacks can arrive damaged if the wrap/packages aren't that safe. What was your experience? Would be really nice to hear. Thank you! Great review!!! I'm going to buy this book immediately. definitely adding this to the "want" list! I've bought this book today, and reading your review I am glad I have! However, I think there is some photoshopping there, and great art in that photography, because different angles create different views and illusions..
Hi, I am a new follower to your blog and I just wanted to say that I really love your DIY and storage tips! They are so helpful and practical. You inspire me in a lot of ways, especially to not be afraid of color (like wearing orange!) and to start my own scrapbook of inspirational magazine pages. Thank yo so much! I have this book and it's the best makeup book I own. I'm agree with you, I want the list of his makeup kit. @HeavenNRJ I never had a problem with them, just that it took about a week to process, my book was in perfect condition and wrapped very well. As was the other book I ordered about a year ago. No complaints from me but you can never be sure :/. I just received mine from amazon as i pre-ordered it a couple of months go..was under £10.00 but i would easily pay more without question..he is amazing and his book is amazing! this book looks like a must have the tips shown in the photos look very helpful thanks for the insite. The work Scott Barnes does is truly amazing, his talent was really showcased with 38yr old Sonia Kapoor, Kohli was married to my uncle 10yearsago0she used him for a passport and cheated on him constantly.